Will Matt Smith soon be handing in his TARDIS key? Matt Smith's first season as the Doctor ended a few weeks ago in the UK, and wraps up next week in the US, but according to a British newspaper, we might not have much longer with Smith in the lead role before he regenerates into a new actor. The Sun reports that sources close to the actor say that Smith will depart the show after he's done filming the next season, as he wants to try his hand at movies. 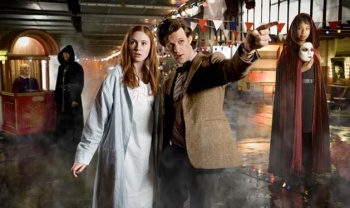 The BBC neither confirmed nor denied the rumor, saying that Smith is filming the Christmas episode and then the second series, but that it wouldn't speculate beyond that point. Smith's departure from the show certainly isn't outside the realm of possibility, although it would be a shame to see him go so soon after taking on the role. Smith has said in the past that he would like the keep playing the role as soon as possible, but that's not necessarily a guarantee that he's staying beyond that second season. There's also the possibility that this isn't actually news to the BBC. It was strongly hinted at in the episode "Flesh and Stone" that River Song had killed some future version of the Doctor, and that was the reason for her incarceration. Perhaps Smith had only ever planned to do two seasons, and the writing team has been teasing his departure for nearly his entire run.